Typbar TCV® is a vaccine containing polysaccharide of Salmonella typhi Ty2 conjugated to Tetanus Toxoid. Vi Capsular polysaccharide of Salmonella typhi alone elicit B cell responses, but the conjugation of bacterial polysaccharide to a protein carrier provides foreign peptide antigens that are presented to the immune system eliciting antigen-specific CD4+ Th cells, referred to as T-dependent antibody responses. A hallmark of T-dependent responses, which are also elicited by toxoid is to induce both higher-affinity antibodies and long-term immune memory. 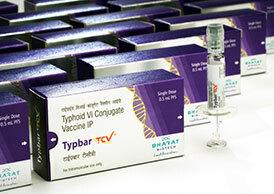 Typbar TCV® is the world’s first clinically proven conjugate Typhoid vaccine. Further, Typbar TCV® is the only approved vaccine for children and infants less than 2 years of age. During the phase 3clinical study, a single dose of Typbar TCV® elicited 4-fold sero-conversion rates of 98.05%, 99.17% and 92.13% in subjects between ≥6 months to 2 years, ˃2 to 15 years and ˃15 to 45 years respectively.Results of this study were published in the Journal of Clinical Infectious Diseases. Results from a human challenge study carried out at University of Oxford have demonstrated that the vaccine is safe, 100% immunogenic, and prevents up to 87.1% of infections, when using real life definitions of typhoid fever. Typbar TCV® has been recommended by the experts at the WHO-Strategic Advisory Group for routine immunizations and is WHO prequalified.